F A Q – SWH Art Studio Inc.
Q: Where can I buy foam? A: I use a 1 lb. expanded polystyrene for carving my sculptures. As the pound rating goes up, the foam gets denser and is harder to carve. Even a 1.5 lb. foam requires different tools to carve. I’m unable to use the wire brushes to shape it. Most sources will have a minimum charge of $200 – $300. You might just ask for scrap pieces or you might try to find someone else who needs foam to go in with you on a purchase. Foam sellers should be able to cut your foam into your desired size. A standard block is 3′ x 4′ x 8′. I can tell you from experience that it is very difficult to manage one of those! I always order sizes that are close to the size I want to carve. That also minimizes waste. Check with your supplier to see if they will take back your scrap pieces for recycling. Be sure to find out what they will take. I need to remove any areas that have glue on them before dropping them off to be recycled. Here is an organization of supplies, listed geographically. I hope you can find a supplier close to you. Happy carving! Q: How much colorant can I use in my mix? The mineral base colorants that I use and sell through my web site can be used integrally in concrete projects or to customize the thin set or grout for mosaic projects. The colors can be combined to make your own unique shades. – The colorants are fine particle materials. Wear a dust mask when mixing them with dry cement based ingredients! – Cover the area where you are mixing with paper. The static electricity of the plastic will make it more difficult to clean up. After you mix the dry mix, you can throw away the paper. – Wear gloves while working with the colorants and cement based materials…even when you are measuring out your dry ingredients. Ultra Blue, Red Oxide (Yellow Shade), Red Oxide (Blue Shade), Black Oxide, Curry Yellow, Yellow Oxide, Green Oxide: 0.1 – 10.00 % by weight of cement content. Titanium White: 0.1 – 10.00 % by weight of cement content. Titanium White added to white Portland cement will result in a whiter product. Carbon Black: 0.1 – 4.0 % by weight of cement content. Super Green, Super Violet, Super Blue: 0.1 – 4.5 % by weight of cement content. These colors provide vibrant colors rarely seen in cementious materials! Small amounts (much less than 4.5%) create amazing colors. Super Green is often used with other colorants for a variety of bright green shades. They are processed differently that the basic mineral colorants and have a finer particle. That is one of the reasons that it takes so much less of these Super colors to get intense results. The manufacturer recommends mixing with moist sand however I typically blend the integral colorant with the dry cement and sand, thin set, or premixed sanded grout before adding liquid to the mixes. NOTE: Mineral based colorants tend to clump in the container. I highly recommend that you work the colorant through a fine mesh sieve/strainer so that the color gets evenly dispersed during the mixing process. The following chart only approximates the color but does represent how the same color varies according to how much you add. As test batch should be formulated prior to using it on any project. Make notes on the formula you use and the type of base (white, grey) used. If I am coloring thin-set, I recommend mixing the color into the estimated (+) amount of dry thin-set that you’ll be using for your whole project to guarantee that the color matches through the piece. Thin-set is a mix of cement and sand (aggregate). To date I have had success with adding a maximum of 5% of colorant to the mix. If I want a darker color, I usually use a grey thin-set; white for brighter or lighter colors. I also suggest you keep a record of your mixes and quantities to enable you to duplicate the same mix at a later date, noting if you used white or grey thin set, or the base color of your grout. METALLICS Super Metalz are a specialty effects colorant that can be used in a variety of ways to produce spectacular results. Colors available in 2 oz quantities: Super gold, Super, Silver, Super Copper. UV stable, they can be incorporated into concrete or grout systems in a variety of methods. Super Metalz can be used integrally at loadings up to 10% but you are loosing a lot of the material in the mix. Super Metalz can be used in a slurry for void filling and vein filling. These are not structural features so high loadings of up to 30% can be used. Mixed with a bonding polymer at a ratio of 1:1 to create a paste. When paste is applied to pin holes or veins, and cured, it produces special surface effects. Super Metalz can be blended into sealers and painted on. Multiple coats will increase the intensity. Super Metalz can also be applied to a freshly grouted mosaic. Once the piece has had it’s final sponging and buffing, while the grout is still a bit damp, sprinkle on the Super Metalz and buff again for a more, overall metallic look. I recommend putting the powder in a small shaker for this application. 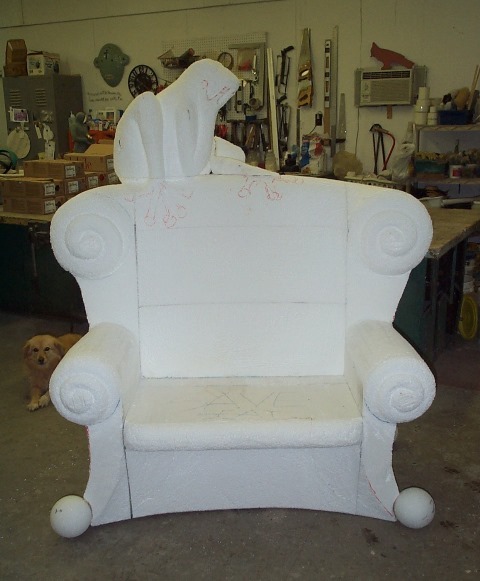 Q: Are your sculptural chairs and benches formed entirely of polystyrene, without a supporting armature? A: Yes…and no. The form of the chair and bench are carved from solid, high density polystyrene. I prefer to use a 1 lb. or 1.5 lb. Any higher than that and it’s too hard to carve. 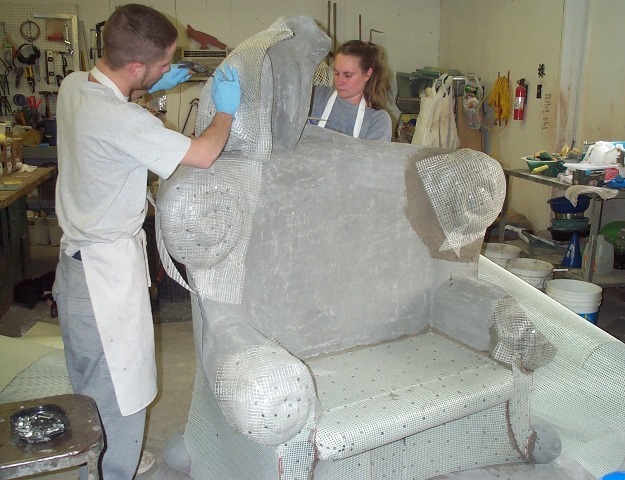 The carved polystyrene is the core for the structural ‘exoskeleton’ that is formed with multiple layers and weights of alkali resistant fiber glass meshes applied with highly polymerized concrete and he polystyrene is completely encapsulated. 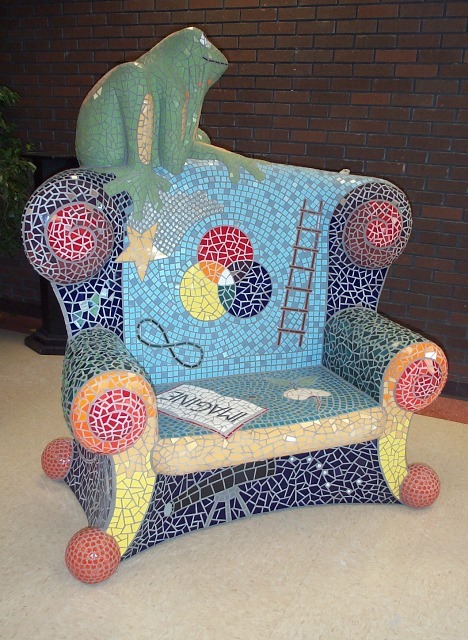 When I’m asked to create one for a commission, one of the first questions I ask the client is if they anticipate moving the chair or bench at some point in the future. Depending on their answer, I will fabricate the appropriate ‘bracket’ for the installation. The bracket has to be fully integrated into the foam prior to the application of mesh and concrete. This system creates a ‘relatively’ lightweight form. For me, more weight is added with the ceramic mosaic and grout than the substrate. Concerns about ‘staying put’ and safety always need to be addressed prior to construction, taking into account if the piece will be used by the general public, codes, and ASTM Standards, along with a good dose of common sense. Sherri – Just read your facebook link to Gerstheim church mosaics, which are fabulous, and have always wanted to try mosaics w/smalti. If you ever wanted to schedule a smalti mosaics workshop, I’m in! I see there’s no grout on them, very interested in learning that technique! Thanks for the interest, Beverly. I’m not sure I would host a smalti workshop as I don’t have the proper tools or materials on hand. You might want to keep an eye on IMA’s schedule in Berkeley. Also Google Michael Kruzich…beautiful smalti work. And then there’s always Smalti.com…Kim Wozniack will get you pointed in the right direction. All that being said, would LOVE to have you come to Bell Buckle for another workshop!